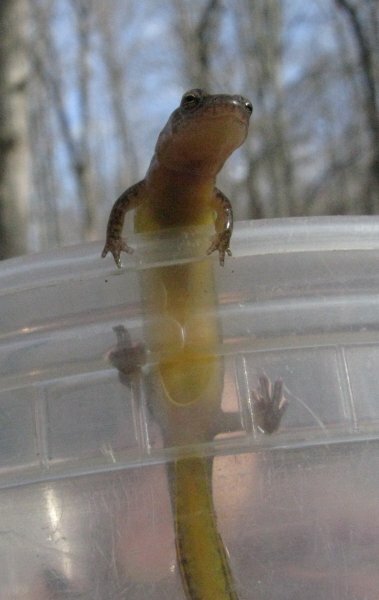 Two Line Salamander found in Ten Mile Creek. Photo Credit: Cathy Wiss, Audubon Naturalist Society. I have recently become involved in an effort to save Ten Mile Creek, also known as the last best creek in Montgomery County (MoCo) Maryland. MoCo even uses it as a ‘reference stream’ against which to measure the health of other streams, which means you can still find salamanders in it, and even a few trout. Not surprisingly, it is now threatened with development impacts. These are associated with a Master Plan for the Clarksburg area, for which the MoCo Council is considering options for a limited amendment that would establish the permissible amount of impervious surface in the watershed, for purposes of protecting the Creek. It just so happens that this creek is also the cleanest source of water for a reservoir that was built in response to the drought of 1966, to augment the flow of the Potomac River during such events. That makes the reservoir an emergency drinking water source, not only for MoCo, but also for much of the Washington Metropolitan Area. As of 1982, the main public water authorities in MD, DC, and VA (WSSC, DC Aqueduct and Fairfax Water) have actually collaborated in the building and ongoing management of this reservoir and another larger one further away in West Virginia. These two reservoirs are jointly managed as an alternative to a plan that had been proposed by the Army Corps of Engineers to build 16 of them. 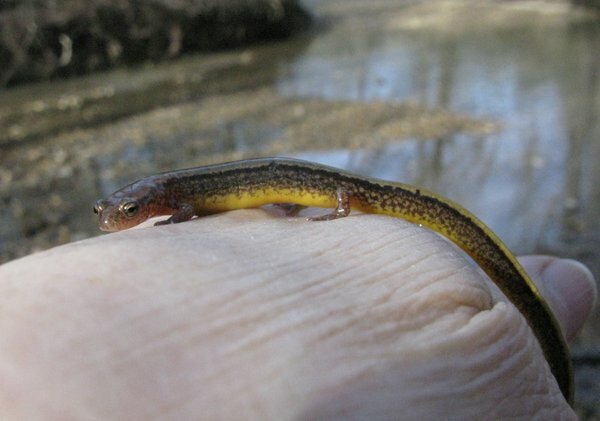 In presentations to the MoCo Council, the MoCo Planning Board has generally conceded that if development activities go forward at proposed levels of imperviousness, Ten Mile Creek would lose its status as a reference stream, which will make it more difficult if not impossible to find salamanders and trout. But the main question at least some members of the Council seem to have is whether or not the reservoir is really a drinking water source (as is stated on the following sign), and whether or not development in one of its three watersheds poses a threat to it. Also, whether more information is needed to make a decision – perhaps so that it can be put off until after the June primary election. To the Council’s credit, the responsibility of local government to protect drinking water is not taken lightly. Not coincidentally, there is a large and growing coalition of citizens groups who support full protection of the watershed, and who, among other things, have been telling the Council: “I drink water, and I vote.” [to add your voice, click here] In addition, three former MoCo public officials, who were involved in the creation of the reservoirs, published an Op-Ed in mid-November which alleges that MoCo is “rolling the dice with the region’s water system.” And last week, the Council received a letter from the Chairman of the DC City Council expressing concern about impacts on the DC water supply. In support of his answer, the DEP representative said the reservoir is not classified as impaired under state standards and that it would not pollute the reservoir any more than the other two previously developed watersheds that drain into the reservoir. In other words, it meets standards, at least for now. But he also commented that protecting Ten Mile Creek would protect the reservoir. Unanswered was the broader question of cumulative impacts from all three watersheds, and of protecting the Creek, which is more sensitive than the reservoir. There was more back and forth with the Council President about whether a study of these cumulative impacts should take place before or after a decision – and if after, why bother? 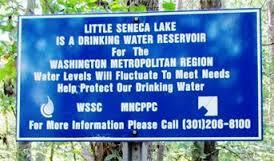 Little Seneca Lake is a Drinking Water Reservoir for the Washington Metropolitan Region. Although it is clear that the reservoir is a back-up drinking water source, as the sign says, the significance of its water quality tends to be dismissed because it is indirect. Water from the reservoir first flows to the Potomac River where it gets mixed with all other sources upstream from the intakes to the water treatment facilities. Also, because it is only used in significant quantities during droughts. Not only are suspended solids an issue but also nitrogen and phosphorus pollution lead directly to the development of harmful algal blooms… precisely at the time that you want to use the reservoir, at high temperature and low flow drought conditions. During a drought, water from Little Seneca Reservoir is released to form a significant portion of the Potomac’s flow. Thus, Little Seneca Reservoir is a crucial source of clean drinking water. It just so happens I found some numbers that allow for a rough estimate of the percentage of flow that would come from the Little Seneca reservoir during record low flow conditions that occurred in the 2002 drought. In that year, releases from the Little Seneca Reservoir occurred on 18 days between July 12 and September 22, with a maximum single-day release of 125 million gallons (Kiang and Hagen, 2003) – which is more than the average amount withdrawn per day by the Potomac Filtration Plant. Adding the lowest flow, 166 million gallons/day (mgd), to the amount of water withdrawn daily for use by all three jurisdictions, 391 mgd, allows for a rough estimate that the amount of water released from Little Seneca would have amounted to between 20 and 25% of the river flow on the days when flow was at or close to the record low. Ten Mile Creek, which appears to be the largest tributary, and therefore over one third of that (~8%), would be the only source of high quality water for purposes of dilution. The percentage could easily go higher if the flow dropped to the minimum of 100 mgd agreed upon to protect the river. For a visual, see the following figure, which contrasts the total flow during the 2002 drought period with the amount that would have occurred absent the water supply releases from both reservoirs. Given that it takes 8-9 days for water to arrive from the West Virginia reservoir, supply from the Little Seneca reservoir could conceivably be higher for a brief period if there were a sharp unexpected drop in river flow. And although not currently set up for use as a backup in the event of an outage at the water treatment plant, the possibility of using it with only minimal treatment was contemplated by John Menke, who was a member of the MoCo Council at the time – as stated in his testimony to the current Council. Flow that would have occurred at Little Falls in the absence of water quality and water supply releases augmenting Potomac River flow. Water quality is closely tied to flow conditions. As a general rule, during low flows, lower levels of sediment and pollutants enter water bodies because there is less runoff but these just build up until the next storm. However, existing pollutants become more concentrated because there is less dilution. With reduced ability of the soils to absorb water, watersheds also become more susceptible to erosion after the drought period (Cummins et al, 2010). Other impacts of low flow are higher temperatures, lower dissolved oxygen, and reduced mixing – particularly in lakes, where lower oxygen zones are likely to remain at the bottom (Delpla et al, 2009). These conditions typically lead to algal blooms and growth of toxic bacteria that can lead to disease outbreaks (Covich, 2009). I recall stronger odors from the river at a riverside picnic during the 1999 drought – somewhere between Great Falls and Little Falls, but prior to the passage of the Clean Water Act in 1972, summer low flows in Washington DC were actually a public health problem (Cummins et al, 2010). Other issues not extensively discussed in the Council work sessions are the implications of our changing climate, in which both droughts and heavier rainstorms could shift from being extreme to routine events. The drought of 2002 set new record lows. And a study by the Interstate Commission on the Potomac River Basin (ICPRB) concluded that by 2040, the “average total annual stream flow in the basin is predicted to decrease in 14 out of the 18 scenarios, by as much as 35%.” Although there is uncertainty as to whether total precipitation will increase or decrease in the region, warmer temperatures are expected to increase evapotranspiration by 6-8%, which is the equivalent of 1.2 to 2.9 inches of rainfall (Ahmed et al 2010b). At the same time, in the northeastern US, the amount of rain falling in heavy storm events has already increased by 74% between 1958 and 2010 (Horton et al 2013). In addition to aggravating water quality problems that could lead to difficulties and higher costs at water treatment facilities, these changes are likely to lead to increasing rates of erosion and runoff, which would in turn lead to more rapid sedimentation of the reservoir and loss of capacity (Nearing et al 2005). Lastly, increases in impervious surfaces aggravate droughts because this reduces the amount of water that infiltrates into the soil and replenishes groundwater, which sustains stream flow during dry periods. This essay has made the case for the ecological and economic significance of Ten Mile Creek. Recently, over a thousand hand-written letters supporting full protection of Ten Mile Creek were delivered to Council Vice President George Leventhal, which is one metric of the value of Ten Mile Creek to the residents of Montgomery County. The question is how protection can most effectively be done, in a rapidly changing context that includes an exploding urban population, uncertain but potentially high costs, and a number of legal and institutional challenges associated with making land use decisions that protect water quality. These challenges include the threat of a lawsuit by at least one of the developers who invested in land in this watershed with the expectation of a Business As Usual zoning decision that would eventually allow relatively high density development to proceed. Ultimately these challenges suggest the need for policy changes at all levels which are beyond the scope of this post but that would enable a more proactive approach to protecting water sources, as well as managing drought and other climate impacts on water resources. The Council needs to support pursuit of the study of Little Seneca Reservoir recommended to County Executive Leggett in October 2013, by Scott Fosler. This study should include analysis of the significance of water quality for water treatment during the low flow/drought conditions for which the reservoir was built, when releases from the reservoir would constitute a larger and more significant percentage of total river flow. Widening the geographic scope beyond Little Seneca Reservoir, a study to consider a region-wide strategy to protect water sources and recommend enabling legislative changes at County, State and Federal levels, is also a good idea. But a study is not a reason to delay of a decision to protect the Creek, which is entirely in the hands of the Montgomery County Council. When will NRO and Mark Steyn et al tell their followers that they are now claiming, in their defense, that their allegations of fraud against Michael Mann were merely rhetorical hyperbole rather than statements of fact that can be proven false? Motions to dismiss a complaint by Michael Mann against NRO and Mark Steyn have been dismissed by DC Superior Court Judge Weisberg, who has affirmed previous rulings. In his ruling, he states that the allegation that the plaintiff , i.e., Michael Mann, “molested and tortured data” is not rhetorically hyperbolic – as was the comparison to convicted child molester Jerry Sandusky. Whether it was false and made with “actual malice” are questions of fact that a jury will now get to decide. For background, see my previous post, and updates by Eli Rabett and Climate Science Watch, which has been keeping the closest tabs on the case. When Michael Mann published what has become known as the hockey stick, he was not expecting the inquisition – from Joe Barton or Ken Cuccinelli or any of a number of other cranks and contrarians. 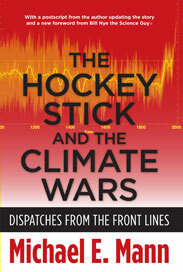 If you have found the twists and turns of climategate confusing, or wondered why there are those who continue to be obsessed with his emails, or why he introduced Bill Clinton at a McAuliffe campaign rally and was featured in campaign ads, this would be a good time to get his book, The Hockey Stick and the Climate Wars: Dispatches from the Front Lines – which was just released in paperback. Even if you have read it, you might want to read the new forward, by Bill Nye the Science Guy, and the update which shows continued vindication of the Hockey Stick, as it continues to be confirmed by additional studies. Those studies, and the now nine investigations in which no improprieties were found, surely make him the Most Vindicated Professor (MVP) ever – as he was referred to in a tweet by Peter Dykstra. But there are even more important reasons to read it. In a nutshell, the book provides a well footnoted account of one scientist’s initially reluctant journey from the laboratory to the political arena, which goes by a very different set of rules, as he became one of the main targets of a deceitful disinformation campaign. In Mann’s words, he went from the “belief that the role of the scientist was, simply put, to do science” and to “avoid entirely the subject of policy implications” to becoming “convinced that there is nothing more noble than striving to communicate, in terms that are simultaneously accurate and accessible, the societal implication of our scientific knowledge.” In so doing, it also illustrates the changing nature of the relationship between science and society, as we grapple with the implications of living in the anthropocene. I drew on the book heavily in a post earlier this year to make the case that those calling themselves “climate skeptics” are not making good faith arguments. Rather, that they are engaged in the performance of a deceptive parody of science, that starts with the act of calling themselves skeptics (Real skeptics actually consider and respond to evidence, and can even be swayed by it). As discussed in a subsequent post, when challenged in a court of law, some of those who have made repeated claims that he has been engaged in fraud and scientific misconduct won’t even stand behind their own allegations. They now claim that their statements were merely “expressions of opinion and rhetorical hyperbole… not assertions of fact” – which could be proven false. If these self-proclaimed skeptics are to be held to the same standards as scientists, there is no better place to start than by demanding that they respond to this book point by point – instead of changing the subject. 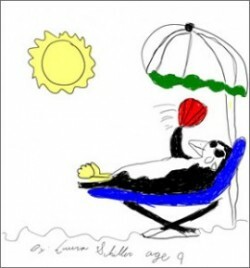 They might also release the code used in the Wegman report and subject it to an actual peer review…. That should keep them constructively occupied and quiet long enough for the rest of us to consider the implications of climate change, and what we can do to actually get to some sort of a new normal. If they cannot or will not be held to these standards, they should be dismissed as cranks, along with anyone who gives them airtime – other than for the purpose of exposing this hypocrisy. But Mann’s story is about much more than just responding to rampant disinformation about climate change – which is important to do but can seem pointless. Given that climate change challenges not only vested interests, but also a deeply entrenched world view – as once did the notion that the earth goes around the sun, widespread denial of the human role in it should not come as a great surprise. Disinformation campaigns take advantage of equally entrenched and erroneous views of science among those to whom the misleading information is directed. Such misinformation only sticks because of unrealistic images and expectations of science, e.g., that, unlike life, it can deliver proof and certainty rather than probabilities. In a rapidly changing world, as we grapple with the consequences of the human capacity to alter global scale processes of life support, even probabilities can be elusive, but science at least provides a basis for learning and hopefully, for detecting those changes in time to adequately respond to them. Therefore it is critical that citizens have some appreciation of the scientific process, if not the technical details of science. A fundamental principle of scientific inquiry is the honest exchange of ideas, the communication of caveats and uncertainty. Without a science-literate and politically aware populace, there can be no match against well-funded, well-organized groups that place little value on honesty or integrity, that cleverly masquerade denialism as skepticism, and that are more than willing to state their own positions in the most absolute of terms, while exploiting and indeed misrepresenting the frank admissions of uncertainty by those they view as their opponents. The idea behind the concept of ecosystem services is that if people better understood the value of ecosystems for such things as providing clean water and storing carbon, they would take action to protect them, or at least be willing to pay for the added costs. This could, in turn, provide a source of finance for the added costs of conservation practices as well as provide an incentive for land owners to implement them. There have been many attempts to do this in various kinds of compensation schemes, i.e., “Payments for Ecosystem Services” or PES initiatives, in which payments are presumably conditional on the provision of a well-defined service. In practice, it is never quite that simple and there have been many lessons learned. Given the variability and complexity inherent in ecosystems, which is exacerbated by rapidly changing conditions, many of these services can be difficult to define. In the context of watersheds for example, payments are often (but not always) made by governments rather than individual water users, for practices rather than for demonstrated benefits which can take time to materialize. Transaction costs of engaging many small landholders can also be high. A commonly cited definition of an ideal PES that includes these and three other criteria is usually accompanied by the acknowledgement that few if any PES initiatives actually meet all of them (Wunder, 2005). Nevertheless, it continues to be viewed as a framework for analyzing and comparing PES initiatives. Although it is absolutely necessary to change the economic incentives if land is to be managed as an ecosystem, what I want to suggest is that the definition of a PES as well as of ecosystem valuation needs to take into account that services from ecosystems have very different characteristics from a loaf of bread. A learning approach will also be needed, that supports the development of new institutional capacities and that links different levels of governance in which individual small scale initiatives are nested. What follows is a framework I developed with a colleague in my earlier work on payments for watershed services, which can also be found buried in a chapter of the Millennium Ecosystem Assessment for which I was a lead author. The effectiveness of institutional arrangements needed to insure provision of the service and access to benefits by those who incur the costs. Another way of putting it is that, an adaptive approach to managing ecosystems will require an adaptive approach to valuation, or will at least require standard approaches to valuation to be used in a broader framework. Standard approaches to valuation and cost benefit analysis were only intended to to used to evaluate small or marginal rather than systemic changes. Before one can even begin to consider costs and benefits, stakeholders need opportunities to learn about changing conditions, and reconsider objectives.